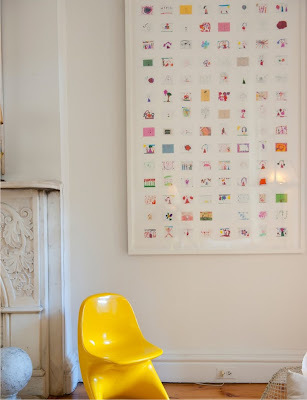 If you are a decor8 blog junkie reader like me you've probably seen this amazing collection of children's art work wall piece by Jan Eleni. I know I have piles of my children's artwork and sadly yes, we did have to depart ways with many that did not make the pile. Another idea and wish I had the material for it right now but, unfortunately that would require a trip to the store and I just got back! Maybe later this week. They have magnetic sheets that you can run through your ink jet. You can buy them here. Basically you'd do the same but, print on the magnetic sheet. 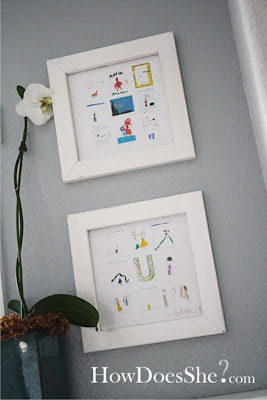 Cut them out and use them to hang up even more fabulous artwork!